The Heritage of Galli Builders: Words from Ray F. Galli Jr.
A company history by Ray F. Galli Jr. The following is the history of R. F. Galli Builder, Inc. and Galli Homes. My father Ray F. Galli saved $10,000 from his bookkeeping position at an Oakland dairy in the early 1920's; soon after marrying my mother in 1925 he started his own construction business. He eventually built well over 3,000 homes and apartment buildings in the Sunset and Parkside districts in San Francisco. He enjoyed an excellent reputation, and was well thought of in the industry. Ray Galli, together with Sunstream Homes, Henry Dolger, Chris McKeon, Christenson, Hayman and other leading builders started the Associated Home Builders of San Francisco. The association was formed to represent its members in union negotiations and other San Francisco building industry matters. In the early 1940's they sent their representative to Washington DC to help establish the National Association of Home Builders (the NAHB). R. F. Galli Builder Inc. and its related business, Galli Homes have been members of Associated Home Builders of San Francisco (eventually the Building Industry Association) and the NAHB from the very first days through 1994 when Ray F. Galli Jr. retired. Though the Associated Home Builders organization was formed to represent builders in union negotiations, R. F. Galli was very well received by the Carpenters Union. During the Great Depression many of our competitors paid just $4 per day and numerous others failed. Union representatives offered to reduce established wages but R. F. Galli Builder Inc. maintained the $8 per day wage level, concerned that the construction workers could never live on such a low salary. The reaction of union leaders led to establish a loyalty that helped the Galli company prosper during the hard times of the Depression Era. My dad never gave up. In 1935 as the building industry was beginning to recover he bought a lot of property in Merced Manor (today adjacent to Stonestown) and built many beautiful homes. He did his own accounting, worked on construction sites and sold his homes on Sundays. He developed what became known by the Federal Housing Authority (FHA) as the Galli Plan. Inspired by a prospective buyer he stayed up late one night and developed another home design that became known as the Tunnel Entrance Plan. This allowed occupants and guests to enter the house in the center of the building and provided extra space and light. More importantly, it reduced construction costs considerably. The FHA embraced this new design concept as well, encouraging competitors to visit our model homes. During World War II, R. F. Galli built another popular line of "Defense Homes" for War-related workers in Bay Area communities like Richmond, California. After the War R. F. Galli Builder Inc. developed a large subdivision in South San Francisco. Around this time the company was devastated after having their accumulation of properties in the Sunset and Parkside Districts taken away by the City of San Francisco under the laws of Eminent Domain (to build schools). These lots had been bought over many years and Galli had to fight for fair compensation. 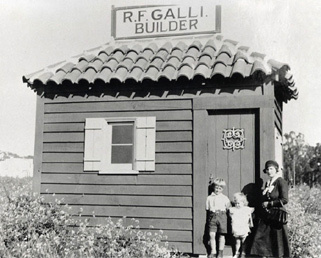 After so many years R. F. Galli Builder Inc. was essentially removed from the home building business in San Francisco. I joined my father after being discharged from the United States Air Force in 1955. R. F. Galli had, for the most part retired after 35 years as a Home Builder and I took over the company. We developed more homes and apartments including some on our few remaining lots. When the San Francisco Redevelopment Agency redeveloped Diamond Heights, we were one of the successful bidders for the first stage. Our homes sold rather well, and we were recognized for our designs. We were again selected out of numerous competitors to complete the redevelopment project and much of our success can still be seen in the Diamond Heights neighborhood today. We later developed a subdivision in Marin County called Seaview. We also built homes in Pleasanton. Around this time our company moved from San Francisco to the San Mateo Peninsula where we have specialized in custom home building and remodeling ever since. We built and remodeled numerous homes from Hillsborough and Burlingame, to Atherton and Cupertino including a group of about 30 homes in the Tobin Clark neighborhood of Hillsborough alone. In 1991, after 40 years of home building and active involvement as a member or executive officer of various building associations I retired. Garry Losk joined Ray F. Galli Builder Inc. in 1985 and remained with the firm until taking over after my retirement though I remain involved as a consultant on various building projects.